I was talking to my best friend a few weeks ago when I asked her how her coworker's family was holding up. Her coworker was one of the passengers on the missing Malaysia MH370 flight. Left behind in the wake of this tragedy were his wife and two daughters who are obviously experiencing heart-wrenching grief. But when my friend told me her company replaced her coworker in less than a month of the plane's disappearance, my perspective on life was forever altered. It's not that I was surprised or shocked that he was replaced so soon. I get it. The company has a business to run and needs warm bodies to help it function. What made a lasting impact on me was the slap-in-my-face reminder that the overwhelming stress I experience at the cube farm is insignificant. If I died tomorrow, no one will say, "Nannette was a great person because she worked after she clocked out for the day." I doubt anyone would remember me by the amount of cases I worked in the day or how many hours I slaved away at work. My entire Facebook, Instagram, and Twitter feeds were inundated with loving tributes to the renowned writer as hundreds of her quotes were posted in her memory. I can't tell you which of her books are my favorite because her entire body of work has been deeply inspirational. I was introduced to her In high school when Maya's book, "I Know Why The Caged Bird Sings" was an assigned reading in English class. It wasn't until I was in my 30s---post-abusive marriage--that I returned to her work seeking therapeutic comfort.. The book and her poem, Caged Bird, resonated in me so much that I built my photo project around it. Last year, I borrowed "Mom & Me & Mom" from the library and wished I bought it. I tend to highlight my books and write notes in my journal as reference points for my own writing. Maya's words have cured my writer's block hundreds of times and uplifted me when I was in the doldrums. 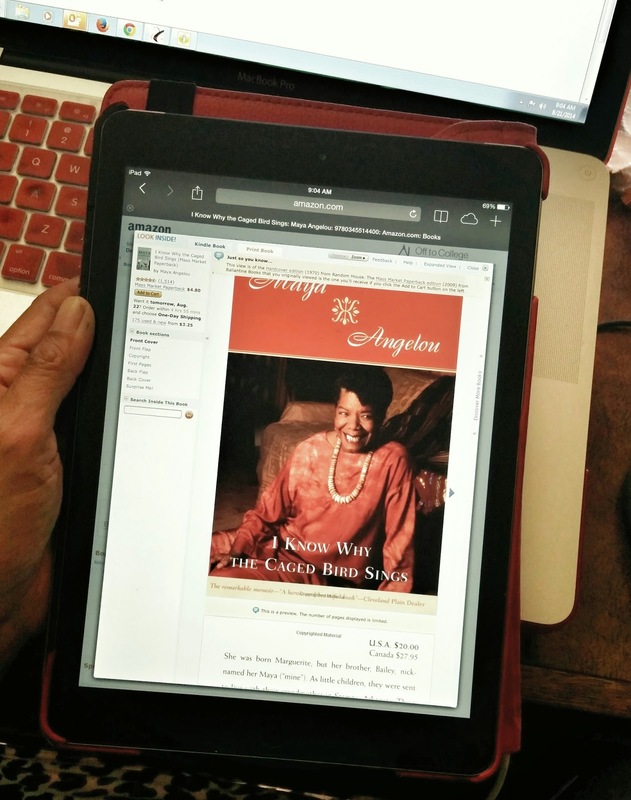 Affectionately referred to as Dr. Angelou, the professor never went to college. She has more than 30 honorary degrees and taught American studies for years at Wake Forest University in Winston-Salem, North Carolina. "I created myself," she once said. "I have taught myself so much. I never finished college or have a degree but not one day has gone by that I haven't taught myself to become smarter, stronger, and wiser. If I die tomorrow I hope to be remembered for how I learned from difficult lessons, how I strive to better myself and the world around me, how I fought for the voiceless, and how I fiercely loved with all my heart.